The setup did look pretty basic mind you, and there were visions of Craggy Island-type freak pointing and spider baby shenanigans. Not a bit of it. 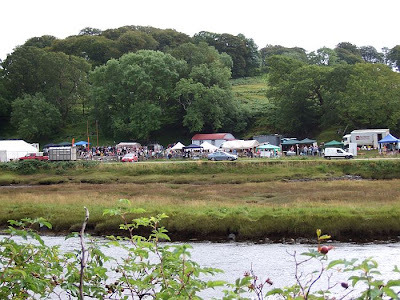 By the time we arrived at the showground, it had been transformed with a couple of big tents, a couple of wee tents, some sort of pole vault bar apparatus, and hunners of sheep and cattle. This was not just a show. 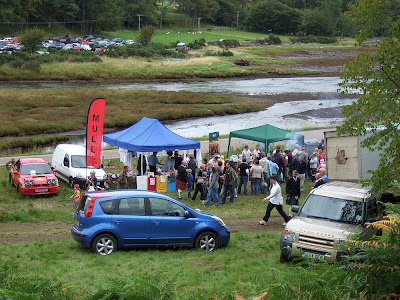 This was the Mull & Morven Agricultural Society Annual Show. It had something for everyone. The first two hours were set aside exclusively for the judging of the many and varied forms of livestock. 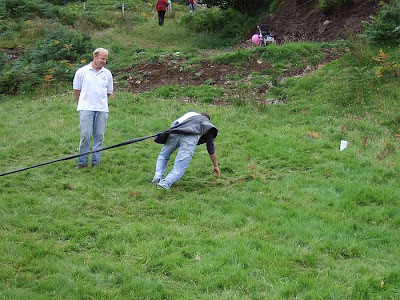 Once the punters started to arrive at noon, there were athletic events - can you overcome the tractor tyre inner tube and grab the bottle of malt? 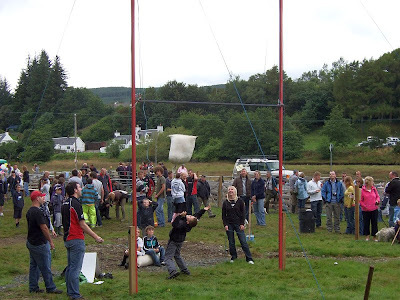 Tests of strength and technique - throw the woolsack (or "sheep sheaf") over that pole vault bar. 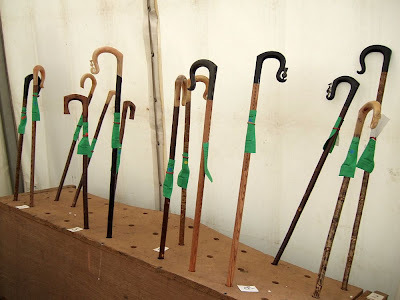 Tests of artistic endeavour - who can carve the best walking stick? 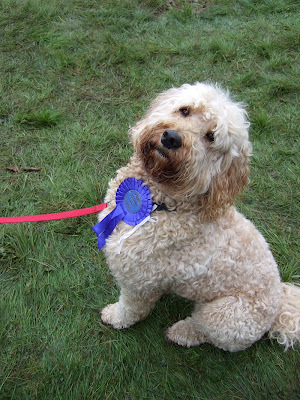 Oh, and a dog show. 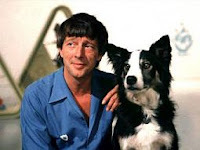 True to its roots, this show had proper dog categories. The runner up in class 6 rang a vague bell. A great day out. We were there four hours, and the time flew by. It was a proper community effort, well supported by the whole island, with a great atmosphere and chock full of happy relaxed adults and excited, laughing kids. Old fashioned maybe, but all the better for it. My favourite event of the day was in the baking/handicrafts tent. I mean, the idea of a scone contest is brilliant enough in its own right but that was dwarfed by the fact that there was a competition to see who could knit the best toilet roll cover.